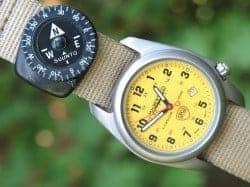 Of all the everyday carry (EDC) gear and survival kit, the compass seems to be something relegated to just a generic noun as if all compasses were the same. The problem is that compasses vary wildly in quality, size, features, and durability. However, the most important feature of a compass is convenience because if you don’t have it with you, it makes no difference how good it is. Suunto makes an excellent line of compasses placing it in the top tier of such objects. 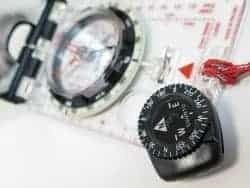 Although I have many Suunto compasses from their large sighting platforms, to their forest clinometers, to a floating marine sighting compass, to wrist compasses, to the topic of this article, the Suunto Clipper compass, the smallest, lightest, cheapest compass in the Suunto line. At less than an inch by less than half an inch, and only one fifth of an ounce, the Clipper can be carried or worn easily. Although a tiny compass, it contains a jewel bearing compass platform in a liquid-filled case. Ten degree increments are marked on its rotating bezel, and luminous notations help with nighttime navigation. The size does have limitations. For instance you need to buy the Clipper compass for the earthly hemisphere you plan to operate on. The small form factor does not allow the compass needle to tip very far so it binds on the housing if you use it in the wrong hemisphere. I discovered this once when I bought a similarly small Silva version in South Africa. Upon returning to the US, the compass no longer worked reliably. I’ve since upgraded to a large Suunto global needle compass for such adventures. Although often relegated to the “button compass” designation, the Suunto Clipper is far from the unreliable, short lived and cheap dystopian world of button compasses. 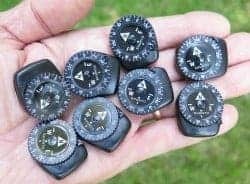 In fact, old prepper wisdom was to order your button compasses by the dozen and just keep the ones that work. Personally, I would much rather have the build quality of a professional compass in a small form factor, rather than a miniature piece of junk. So much so, in fact, that I throw away cheap compasses should I come across one, or be given one at a conference as bling or swag. There is absolutely no survival advantage to keeping it around regardless of how many times you watch Rambo use one. The Suunto Clipper gets its name from the clip mechanism on the back of the compass. It provides a workable solution to affix the Clipper to thinner watch straps, gear straps, paracord, lanyards, map edges, and anything else you can wedge into the clip. The opening edge of the Clipper’s clip has a small overlapping notch that will keep the Clipper clipped. But if the Clipper’s clip is attached to something larger than the clip, the Clipper’s clip could slide off. The face of the Suunto Clipper contains an obvious north designation marked by a large triangle containing the letter N. West and East are also noted by large letters, and Suunto’s own branding marks the south end of the spinning disk behaving as the needle. The humble compass is invaluable, and even life saving when navigation is of primary survival concern. Many times when someone becomes lost, they wander in circles. Large circles, but circles nonetheless. With a compass, the problem is solved (hopefully). Many times when someone is lost, they are also running out of time, water, food, and warmth. A compass can keep them on a direct path to safety. And half of all survival situations occur at night where there may not be any visual cues of direction. A compass can simplify nighttime navigation and keep you on the straight and narrow. And finally, cities can be a real obstacle for effective navigation especially when you are not familiar with the area. A compass can set you straight, and keep you headed in a productive direction. The Suunto Clipper Compass is a fine precision instrument that is so durable it can be used scuba diving. Although on the small side for such use, it does function in hostile conditions, and can keep you on the right path regardless of where you are as long as it’s in the correct hemisphere. Personally, I always carry a Suunto Clipper Compass in my pocket whenever I travel. 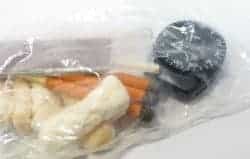 It’s one of the few things the TSA couldn’t care less about, and at barely larger than a stack of two nickels, you won’t notice it until you need it. In fact, at the risk of sounding paranoid, I often have several Suunto Clippers with me when wandering outside my neck of the woods. Sure, I like the larger compasses for map work or those adventures where a compass is as integral a component in my kit as as a knife, but even then I have the Suunto Clipper with me as well. I’ve lost compasses, broken compasses, and had to give away a compass to someone who needed it more than me, so having a backup compass is hardly a sacrifice. So as the weight-to-importance ratio goes up, nothing can compete with the Suunto Clipper Compass. Its small stature can occupy a huge job in your kit. So don’t bug out without it.